At Integrative Nutrition, we are honored to play a role in helping you discover your passion for healthy living. Each student takes a different path after graduation, and today we are shining our spotlight on 2012 graduate Jessica Geier. Jessica’s interest in health and nutrition began when her grandmother was diagnosed with cancer. She channeled her nurturing spirit by preparing nutritious, healing meals to help her grandmother through treatment. Jessica has since paired her education from the Health Coach Training Program with her father’s entrepreneurial background, and together they created a fulfilling new business in Neptune, New Jersey! I finished my graduate degree in 2007 and immediately jumped into a job as an architectural intern. I knew right away that this work wasn’t fulfilling, but I stuck it out as long as I could. After nine months, I quit my internship and tried out a couple of other jobs. It was exciting at first, but after the learning curve wore off, I was right back where I was before: feeling like I wasn't doing what I was meant to do in life. After those jobs, I started working with my father. He is an entrepreneur and at the time, he had a few small businesses that I was helped him systematize. I started to get that same feeling again, and realized it was time to find a fulfilling career. Just after I started working with my father, his mother – my grandmother – was diagnosed with pancreatic cancer. She moved in with my dad and I took over the role of cooking. I started researching everything I could find to learn about feeding her nourishing meals that would keep her strong to get through chemo. This is where my understanding of food and health began to change. After she passed away, I realized that I needed to change the way I was taking care of myself, or more accurately, not taking care of myself, so that I could prevent disease in my future. I was scared because cancer runs on both sides of my family. Shortly after I enrolled in the program, I knew I was in the right place. I met people who were on the same page with me, people who believed the same things that I did. As I learned new information each week, I became more confident that I was doing the right thing. I was doing something that I felt proud of, something that would change my life and the lives of those around me. For the first time I was incorporating what I love – cooking and food, with something I believe in – nutrition and healthy living. I knew I could create a career in Health Coaching that would allow me to do what I love every single day. Around the time I enrolled at IIN, my father and I were talking about what business we wanted to develop. We were exploring a few options, but the one that I was drawn to was a fresh pressed juicing company. At that time I was sharing with him everything I was learning about the benefits of food on our overall health, and he was starting to get on board. It didn't take much to convince him that juicing was the way to go. Thus, Raw Generation Juices was born! It’s wonderful that you had the courage to start your own business! Did you ever experience any doubt, and if so, how did you work through it? I was confident about the growing market for fresh pressed juices, especially with my newfound network within the Integrative Nutrition community. I knew that my role as head of marketing would be something I could really dig my teeth into and enjoy. What makes Raw Generation unique? Before we started our company, my father was an on again, off again juicer. After a while, he became discouraged with the time it took and the mess it made. He had looked for a company that sold leafy green juices, but there were none in our area! This was one of our motivations to start Raw Generation. Tell us more about the products you offer. 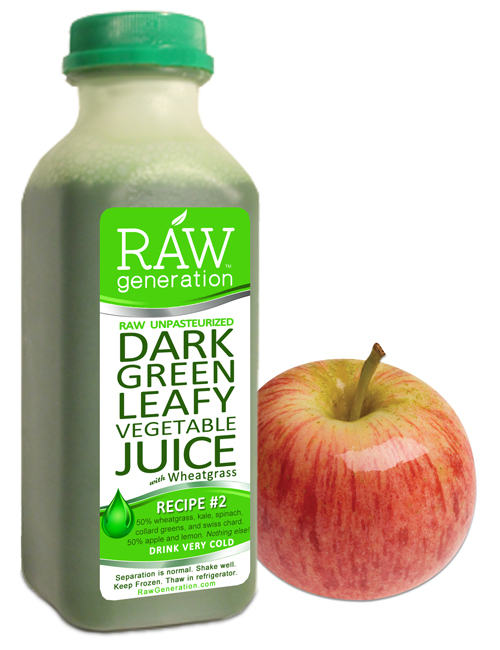 Raw Generation sells leafy green vegetable juice blends. We started focusing on the dark green leafy vegetables (kale, collards, spinach, Swiss chard, & wheatgrass) because of the immense health benefits they offer. We currently offer a few signature blends, and we will be expanding our line while keeping all of our juice blends at least 50% leafy green vegetables, including organic wheatgrass juice. I love that I can get up every morning and honestly say that I am spreading health and happiness in the world. I am also helping myself become healthier on a daily basis. I had heard that when you are doing something you love, it doesn't feel like work. I believe that now.